Habitat: The plant is native to central Asia. It grows best in temperate regions, on well-irrigated soils. 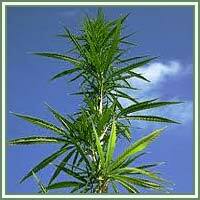 Description: Cannabis is an annual plant. It grows up to 5 meters in height. It has erect stems, stiff and fibrous, and leaves oppositely arranged near the bottom, alternate near the top. They are palmately divided into 3 to 7 toothed leaflets. Flowers are very small and green, appearing in late summer. Medicinal use: Cannabis has a very long history of medicinal use. It has been traditionally used by different cultures in treatment of various types of ailments: asthma, cystitis, diarrhea, dysentery, gonorrhea, gout, epilepsy, malaria, fevers etc. The whole plant is considered to be anodyne, anti-inflammatory, antispasmodic, cholagogue, diuretic, emollient, hypnotic, hypotensive, laxative, narcotic, ophthalmic and sedative. Today, cannabis is used as help in relieving side effects of cancer treatments, such as nausea and vomiting. Since it increases the desire for food, it is also used in treatment of anorexia nervosa. 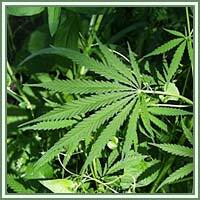 Cannabis can be used externally in treatments of gout, sores, varicose veins and rheumatism. Safety: Cannabis is a narcotic. Improper use can produce intoxication with hallucinations. Some herbs could react with certain medication. Therefore, it is advisable to consult your doctor before consumption of any herb.